It’s days like yesterday—dry, bitter cold ones with overcast skies but no rain, days where my sleep deprivation, worry and dread get the best of me—which get me thinking about the world, how hard life can be, how much pain people endure, how my son Calvin doesn't really have a voice to tell us if he is suffering, and how much better things would be if he could. I was reminded of a debate I had several months ago on Facebook, which I described in my blog post, black sheep, scapegoats and wild white horses. The subject was Sandra Bland, the black woman who was found hanged in her jail cell after having been brutalized then arrested by a white police officer who had pulled her over, ostensibly for failing to use her turn signal. I cited racism, asserting that Ms. Bland was treated barbarically because of the color of her skin. A handful of whites—some friends of mine, others not—in subsequent comments insisted Ms. Bland’s handling was purely because she had not complied with the officer, who was later removed from his beat for having violated protocol. I respectfully, yet emphatically, countered their arguments—which included personal narratives of incidents with cops which had turned out rosy—by underscoring what I felt was, at least in part, likely at play: their white privilege. Still, they stood their ground, denying any notion that race had played even the slightest role in Sandra Bland’s demise. Really, not a day goes by that I don’t wince, that my heart doesn’t shudder, at the gross injustices against African Americans which occur at a sickening rate in this country—in day care centers, preschools, grade schools, high schools, colleges, neighborhoods, parks, streets, homes, employers, shops, juvenile detention centers, prisons and churches—in epidemic proportions. Yesterday morning, I watched a video of a sixteen-year-old South Carolina girl being grabbed by the throat and yanked from her school desk by a Richmond County deputy (why do we need police response for a girl using her cell phone in class?) tossed backwards in her seat, dragged out of the chair, flung across the room, then cuffed. What parent wouldn’t be enraged if their daughter had been similarly violated? 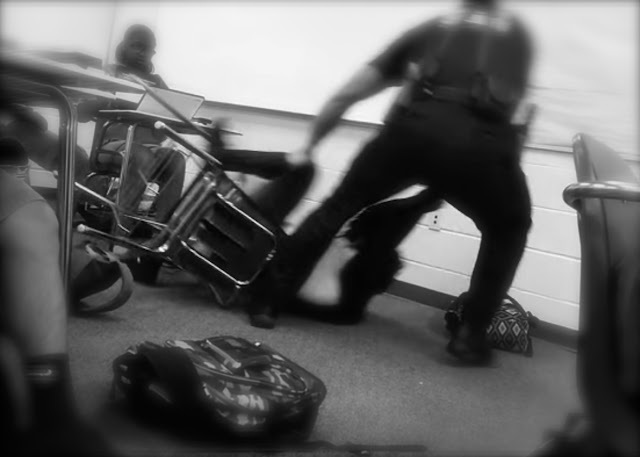 In fact, it is nearly impossible for me to imagine a cop using that kind of force if the student were white. The girl was silent. The girl was calm. The girl was non-violent and unarmed. A classmate, another black girl, took a stand, recording the brutality on her phone and verbally challenging the abuse. Her reward: arrest. Like Sandra Bland, some white people were quick to blame the student's treatment on her noncompliance, as if her obstinance warranted this kind of physical abuse. The power that white law enforcement wields, the sweeping racism inherent in our policies, the prejudice some white people employ—and the privilege they steadfastly deny—are longstanding and formidable and, like in one of the videos, too many of us just sit back and watch injustice fly. And as we sit at our comfortable white distance, and stand our ground and ignore the facts and divert the conversation and rewrite our history and blame the victim and milk the scapegoat and declare our colorblindness and deny our role, we are nothing but complicit. I think I may have lost a longtime friend as a result of the Sandra Bland Facebook clash and/or my blog post about it, someone who, it appears, may have taken offense with my argument, though I'd done my best to remain steady, credible and calm and took care to not make it personal. And so, one might ask, was it worth it? Why bother? I bother because I am human, because that young woman pulled over or that child wildly plucked from her chair, if not for the accident of birth, could have been mine. I bother because of Calvin who, like so many others, does not have a voice. But I have a voice, and in the face of inequality, wrongdoing, hate, racism, classism, bigotry, violence, greed, contempt, abuse of power or ignorance of privilege, I'll keep trying to use it as best I can. It's just so over-the-top outrageous and probably frighteningly mundane. I don't know what to say. I'm struck dumb. I too always have the autonomic reaction that there, but for a chance of genes, could go I..and that is profoundly disturbing. It is so wrong.